VeraCrypt is a disk encryption tool that works on Windows, macOS, and Linux. 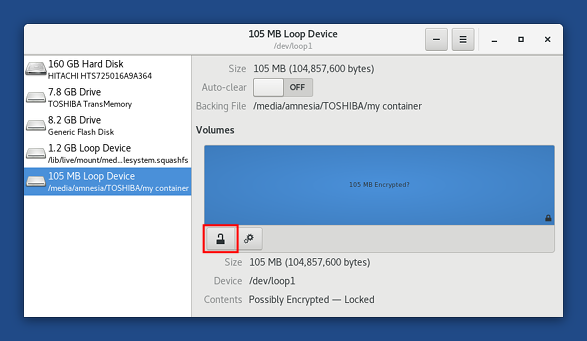 You can also create and open LUKS encrypted volumes in Tails. LUKS is the standard for disk encryption in Linux. See our documentation about LUKS. VeraCrypt to share encrypted files across different operating systems. LUKS to encrypt files for Tails and Linux. See the difference between file containers and partitions. See Tyler Burton: How to migrate from TrueCrypt to LUKS file containers. Plausible deniability: in some cases (for example, with VeraCrypt hidden volumes), it is impossible for an adversary to technically prove the existence of an encrypted volume. A file container is a single big file inside which you can store several files encrypted, a bit like a ZIP file. Usually, drives (USB sticks and hard disks) have a single partition of their entire size. This way, you can encrypt a whole USB stick, for example. But, drives can also be split into several partitions. Keyfiles: instead of or in addition to the passphrase, a VeraCrypt volume can be unlocked using a particular file or set of files. See the VeraCrypt documentation on keyfiles. PIM: a number that is needed if it was specified when creating the VeraCrypt volume. See the VeraCrypt documentation on PIM. Due to current limitations in Debian, using a PIM fails in Tails. It will become possible in Tails 4.0 (late 2019). 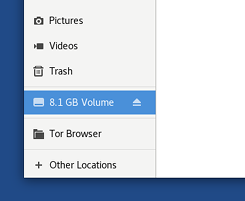 Hidden volume: if you want to unlock the hidden volume inside the VeraCrypt volume. See the VeraCrypt documentation on hidden volumes. 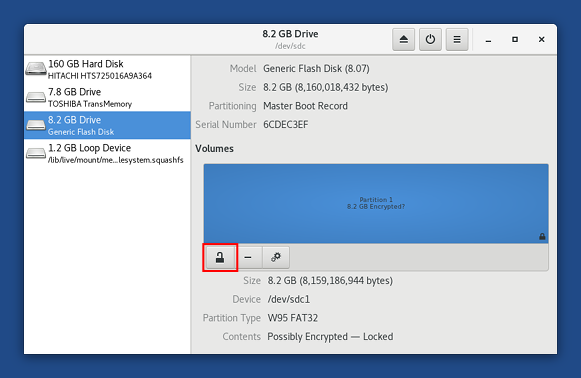 System volume: if you want to unlock an encrypted Windows system partition. See the VeraCrypt documentation on encrypting a Windows system partition. Choose Applications ▸ Utilities ▸ Unlock VeraCrypt Volumes. Click Add and choose the file container that you want to unlock. Enter the parameters to unlock the volume. For more information, see the Unlocking parameters section above. Unlock VeraCrypt Volumes unlocks your volume. If unlocking the volume fails (for example, if you mistyped the password), click on Unlock to try unlocking again. Click Open to open the volume in the Files browser. Choose Applications ▸ Utilities ▸ Disks to start the Disks utility. Choose Disks ▸ Attach Disk Image… from the top navigation bar. Unselect the Set up read-only loop device check box in the bottom-left corner if you want to modify the content of the file container. Choose All Files in the file filter in the bottom-right corner. Navigate to the folder containing the file container that you want to open. Select the file container and click Attach. In the left pane, select the new Loop Device that corresponds to your file container. In the right pane, it should have an Encrypted? label. Click the button in the right pane. Select the file system that appears below the unlocked volume. It probably has a FAT or NTFS content. Click the button to mount the volume. Click on the /media/amnesia/ link in the right pane to open the volume in the Files browser. In the sidebar of the Files browser, click on the button on the label of the volume corresponding to your file container. In Unlock VeraCrypt Volumes, click on the button in the line that corresponds to your file container. If your partition or drive is on an internal hard disk, set up an administration password when starting Tails. Otherwise, plug in the USB stick or the hard disk that you want to unlock. In the list of partitions, click Unlock in the line that corresponds to your USB stick or hard disk. In the left pane, select the drive that corresponds to your USB stick or hard disk. 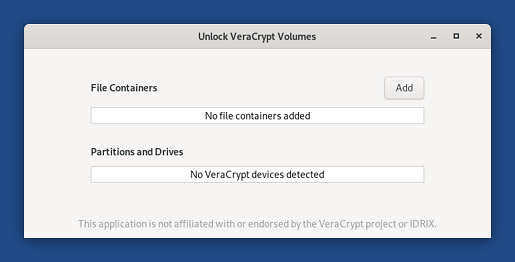 In the right pane, select the partition that corresponds to your VeraCrypt volume. It should have an Encrypted? label. 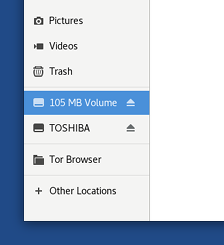 In the sidebar of the Files browser, click on the button on the label of the volume corresponding to your partition. 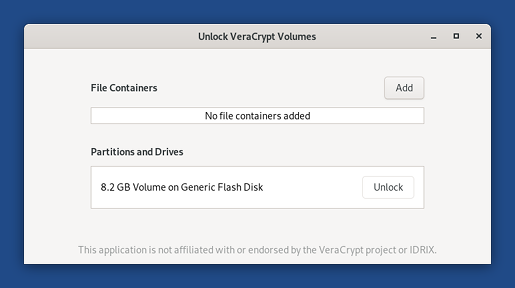 In Unlock VeraCrypt Volumes, click on the button in the line that corresponds to your USB stick or hard disk.